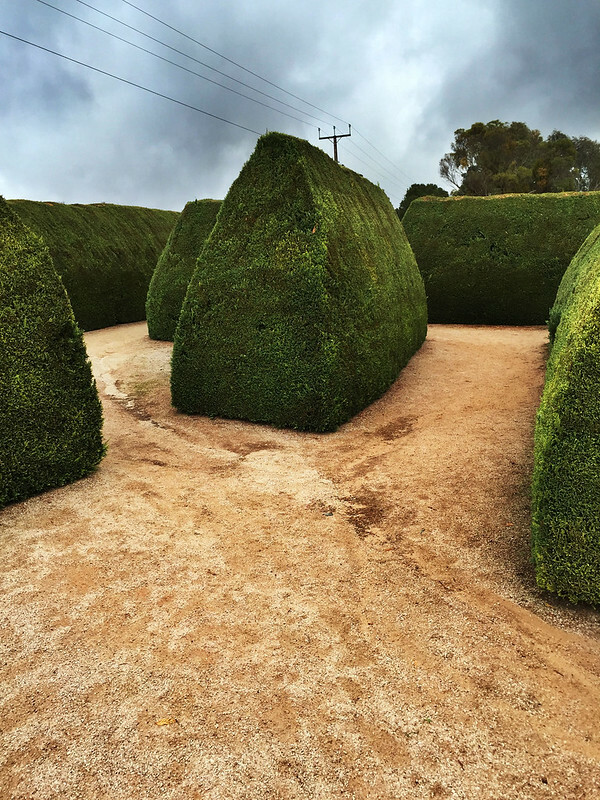 Entering the maze, we quickly found that there were several small statues scattered amongst the twisting and turning hedges. A skull was labelled as a Collingwood supporter. Further on was a montage scene made of statues re-enacting the Mad Hatter’s tea party, so I wrote down that Alice was lost in the maze. We found a camel statue, with one hump. We explored the several branching passages to try to see everything, and eventually found the central fountain area, which was at the end of a long dead end. 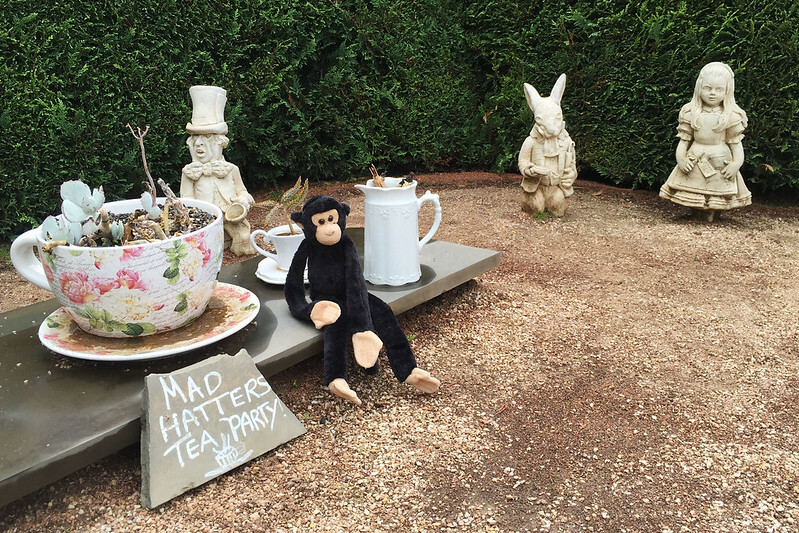 Mad Hatter’s tea party in the Mintaro Maze. I was a bit perturbed that none of the gnomes we’d found had red hats. This was explained when we finally emerged from the maze into the garden area, where several cafe tables were set up, several with large chess sets or other classic board games on them. On one side of this area was the gnome village, which contained probably over a hundred garden gnomes of various sizes and poses. I counted the ones with red hats and my first attempt came to 52. But then I noticed a few more lurking in hidden places as we walked around, so I recounted, twice. Finally I was happy with a total of 58, though I asked M. if one of the gnomes had a pink hat, or if it was a red hat that had just faded a bit. She said it was pink and my count should be reduced by one, but I decided it counted as a faded red hat and wrote 58 on the sheet. 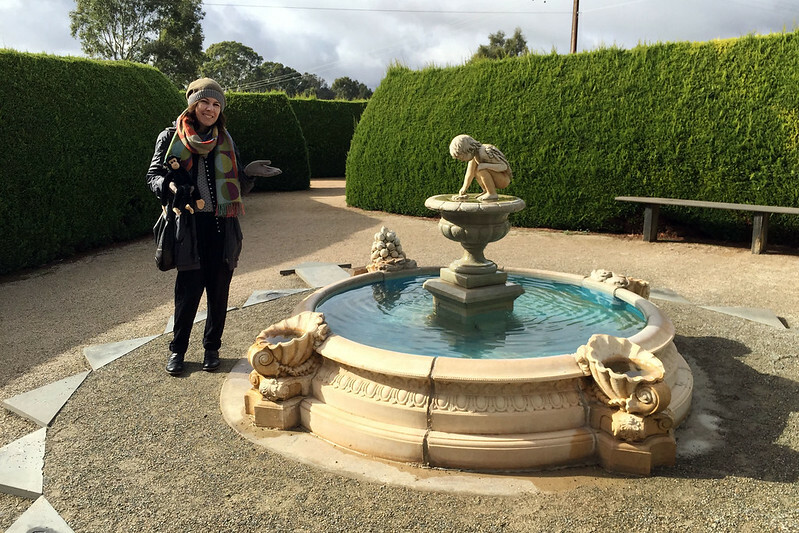 Centre of the Mintaro Maze. We walked around the garden a bit, finding a giant chess set on the ground behind the entrance building. Further back was a private area with a garden and a house, obviously where the owner lived. We went inside the entrance building to browse through the souvenir puzzles and games inside, and the woman asked how we went with the question sheet. I showed her our answers, and we got almost all of them right. However I’d written Aphrodite for the “love” question, thinking a classical style statue of a semi-naked woman we’d found was the goddess, but apparently the answer was Cupid, which we didn’t see at all, so we must have missed part of the maze. For the red hatted gnomes the answer was… 57! M. berated me for including the pink hatted gnome, which had pushed my answer up to 58. So close! Leaving the maze, we drove on to the nearby Martindale Hall, which is a Georgian style estate house built from local stone in the late 19th century, and in excellent condition. 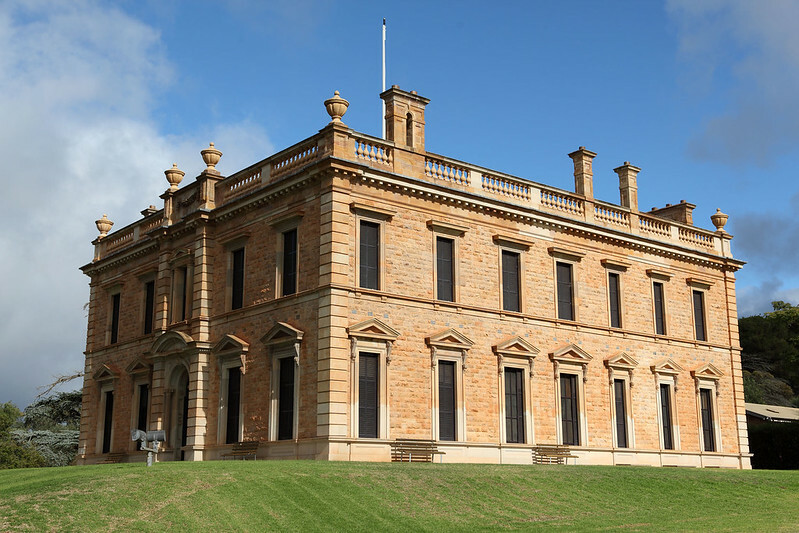 It is open for visitors to look around, and was featured as the house in the film of Picnic at Hanging Rock. The lady at the maze had given us a voucher for discounted entry, so we paid $10 each instead of $12. 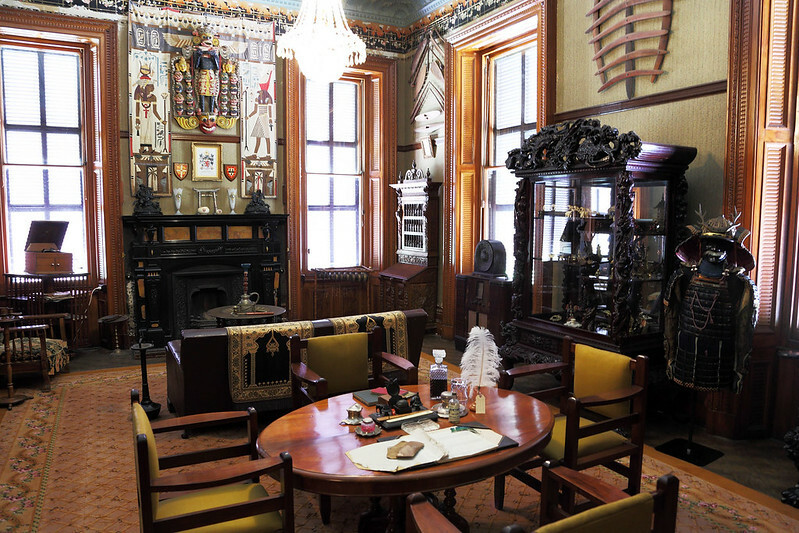 The tour was self guided and took in most of the rooms over the house’s two grand floors. We ventured upstairs first and did a loop of the building, reveals in two servant bedrooms, a nursery, a nanny’s room, a guest bedroom with en suite bathroom, the master bedroom with en suite bathroom, a child’s bedroom, and a sewing room. The child’s bedroom was called the Valentine Room, after the boy named Valentine as he had been born on Valentine’s Day. He died at age eight in 1901, but the explanatory sign said he’d been seen several times since as a ghost. 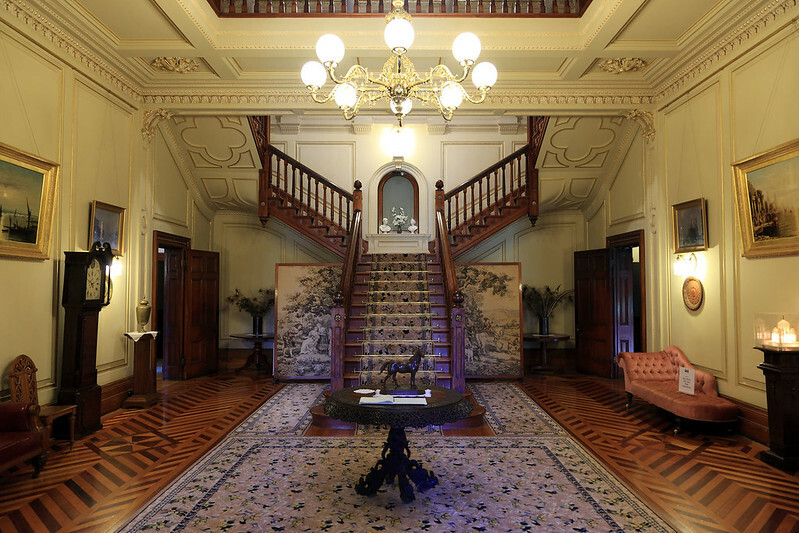 Entry hall of Martindale Hall. The ground floor consisted of more servant rooms which were closed for use as offices, a kitchen, a bar room full of wine bottles and other drinks, a grand dining room, a drawing room with a player piano, a smoking room decorated in classic Victorian style with trophies and artefacts from all around the world, and a billiards room, which doubled as a library as it was lined with bookshelves. The billiard table was a real antique, full sized and made of slate in a heavy wooden frame. It had been put into the room before the exterior wall of the house had been completed, and because there was now no way to remove it from the room it had been in there ever since. The decorations and furniture in the whole house were amazing, and it was definitely worth the time to visit and explore this place. Trophy room in Martindale Hall. Outside, we walked the 300 metres or so over to the coach house, which was built of similar stone and large enough to hold several coaches. Behind it were stables suitable for a dozen horses or so. These buildings were all set on land that was still quintessentially Australian farmland, with no large attempt to landscape the grounds or turn it into an English style garden. There was a stand of pine trees, but elsewhere it was all eucalyptus and rolling pasture land. The weather today had begun very foggy when we woke up, but it had lifted to reveal a patch sky, mostly cloud with the odd spot of blue sky. It had remained rain-free at the maze, but at the Hall we had a light sprinkle of rain as we walked out to the coach house. It remained mostly dry but with the odd sprinkle now and then throughout the rest of the day. 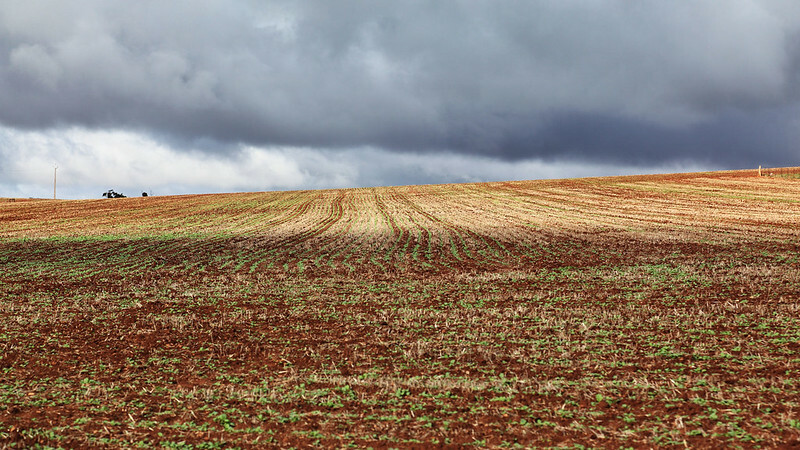 Stormy clouds over fields near Mintaro. From Martindale Hall we drove back to the main Clare Valley road and across it to find Skillogalee Winery and Restaurant, where we had booked ahead for lunch today. This was a small looking winery nestled in a secluded valley behind a row of hills from the main road. The main building was an old farmhouse, looking a bit decrepit on the outside and covered with vines, but the interior had been fitted out as a fancy restaurant, with a very small wine tasting room at the main entrance. A lady led us to our table at one end of the veranda, which was enclosed against the chill by clear plastic sheeting, giving us a view down the valley and over the vineyards. Middle Eastern Atlantic salmon, Skilogallee Winery. M. went unconventional by ordering a cheese platter first, to be followed by the soup of the day, which was spicy zucchini. They had five cheeses available, an aged cheddar, an ashed goat’s cheese, a “touch of blue” mild blue cheese, a triple cream Brie, and a washed rind cheese. M. chose the cheddar, the goat cheese, and the Brie. I opted for a more traditional approach, with an entree of duck liver parfait, followed by the Middle Eastern Atlantic salmon with rice and yoghurt. The cheese plate came with almonds, dried apricots, quince paste, and crackers. The parfait came with toasted slices of baguette and a little rocket salad. The pate was topped with a layer of transparent pink jelly, which I think was red wine jelly. It was smooth and delicious. The salmon and M.’s soup came after I’d finished my entree, but while she still had a bit of cheese left (we’d arranged it this way). 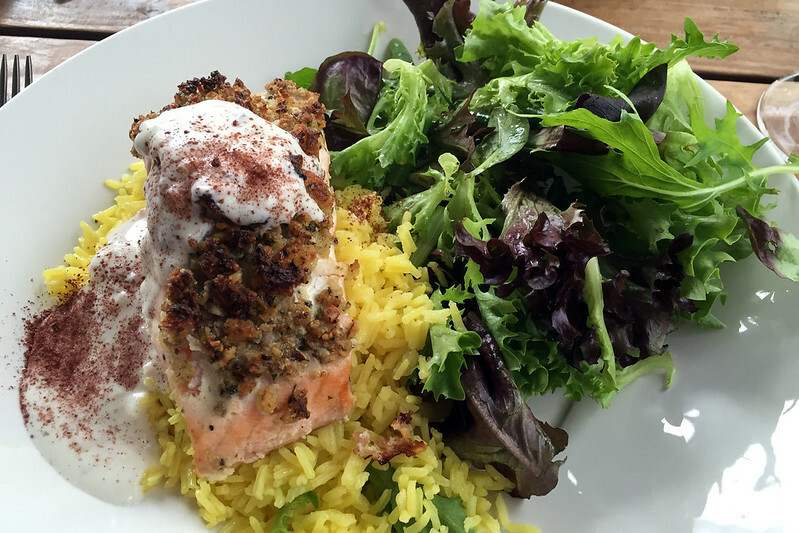 The salmon was crusted with roasted walnuts and topped with a spiced yoghurt, and came with a salad of lettuce and green beans. The zucchini soup was creamy and spiced with cumin and possibly other things. The food was all very good. With it we had some of the Skillogalee wines: M. chose the late harvest Riesling for some sweetness to go with the cheeses, while I tried the Gewürztraminer, which has won awards. The wines were also very good. M. had a second glass, choosing the rosé, but I made do with the one as I was driving. After this leisurely round of food, it was time for dessert! 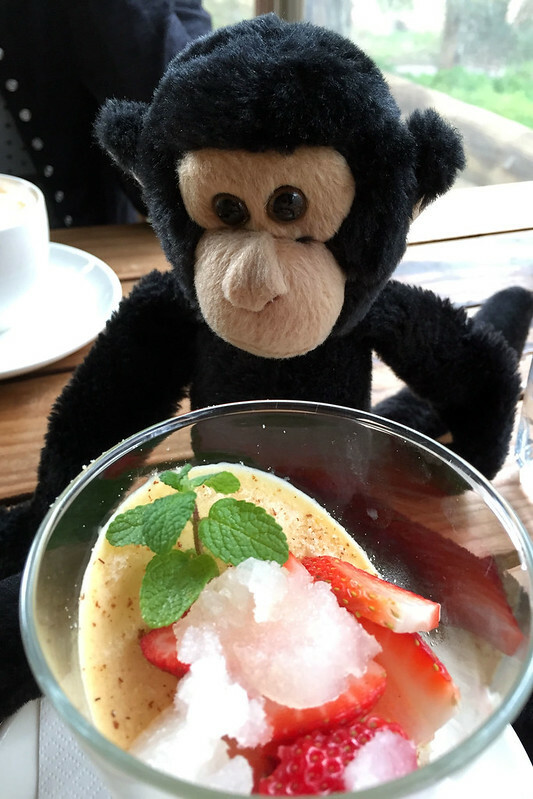 The apricot pannacotta looked good, garnished with crumbed almonds, toffee pieces, strawberries, and pear granita. It was smooth and delicious. 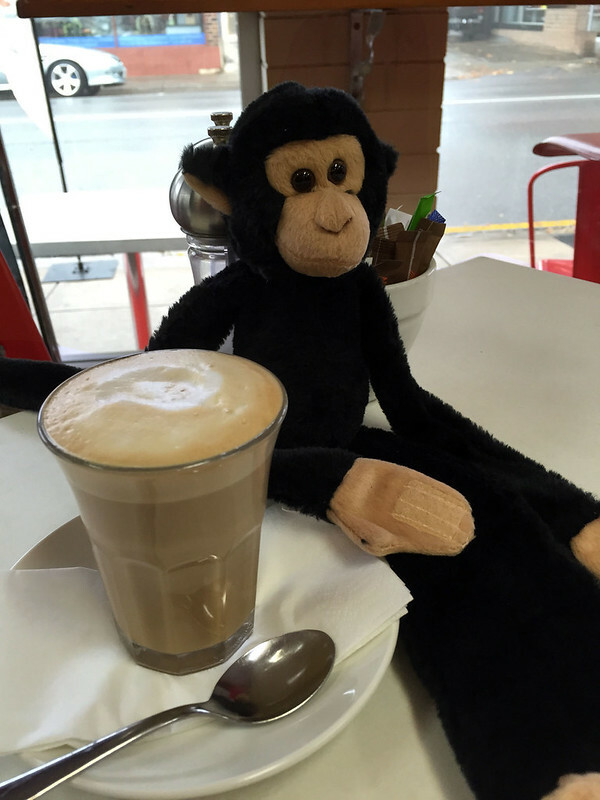 M. had a flat white coffee while I had the dessert. This stately lunch done, we set out to drive for the remainder of the afternoon back to the Barossa Valley, beginning our journey south to McLaren Vale via Hahndorf. The Barossa makes a good stopping point for another night, so we have checked into the Vineyards Motel at Angaston. On the way here we passed through the small towns of Saddleworth, Marrabel, Kapunda, and Greenock. 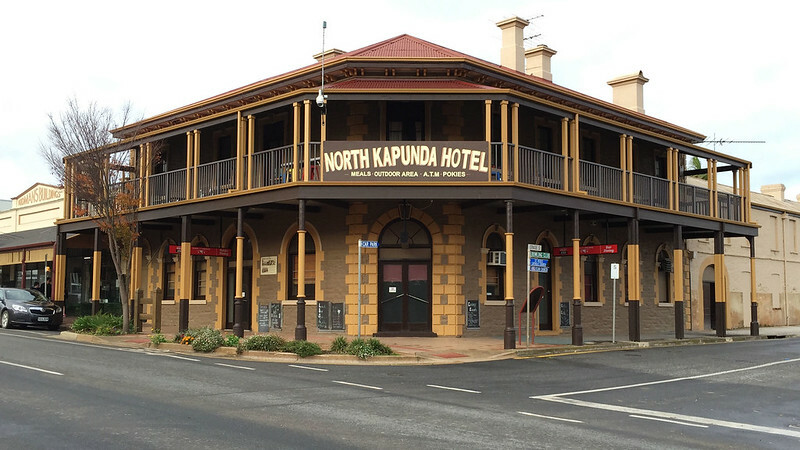 We stopped in Kapunda to stretch our legs and walked up and down the main street. When we got back to our car, the roundabout right behind where we’d parked was blocked by a fire engine and ambulance, with firemen pouring sand on the road, presumably to soak up spilled petrol from a crash which must have occurred in the few minutes while we were down the other end of the street. We’d driven right through the same roundabout not 20 minutes earlier. The plan for tonight is to walk into Angaston from the motel, which I estimate should take us maybe 20 minutes, and find a place for a simple, light dinner, as we are both somewhat full from lunch still. Our plan to walk into Angaston lasted as far as around the corner from the motel. The road was unlit beyond the intersection and a sign indicated it was 2 kilometres to town. Not only was the road unlit, but it was a dark night, with clouds obscuring almost all the stars, and rows of trees shadowing the road. And about 100 metres away we could see the road descend into a small gully where a narrow bridge crossed a creek, with no footpaths on either side, and the occasional car zooming through at 80 km/hr. So, discretion being the better part of valour, we returned to the motel and drove the car into Angaston. We did, however, stop at the first available parking place once we reached the town and street lighting, and walked roughly 500 metres into the centre of the town where the shops were. We entered the Roaring 40s Cafe, which served pizzas and pasta for dinner. We had no trouble getting a table, as only one other table was occupied when we arrived, and they soon left, leaving us the only ones eating in. They were doing a roaring trade in take away pizzas though, with someone coming in to pick up an order every few minutes. This place has won numerous pizza awards, with several pizzas highlighted on the menu as winning various categories in South Australian competition. But the standout was the smokey pizza, which had been awarded best overall pizza in Australia in 2009. It contained toppings of mettwurst, lachsschinken ham, shallots, smoked feta, bacon, and smoked chicken. Naturally I ordered one of these, while M. decided to go with a salad of rocket, pear, walnut, and blue cheese dressing, not being very hungry after our substantial lunch. 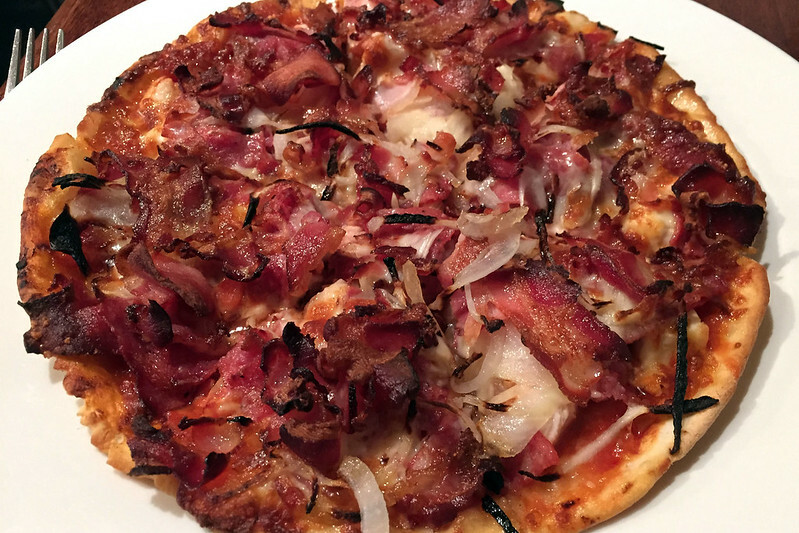 “Best Pizza in Australia, 2009”: Smokey pizza, Roaring 40s Cafe, Angaston. The pizza was truly excellent, with a nicely smokey flavour and savoury meatiness. I washed it down with a Mountain Goat ale, which was a good choice to break up the saltiness of the pizza. The salad was also very good, with generous amount of thin slices of pear and crumbled walnuts, not just a mass of 90% rocket leaves like some places do, and topped with shaved Parmesan. These consumed, I had to try the apple strudel which was sitting in the cake counter. M. ordered it by going up to the counter, and she said she’d asked for the cream it came with to be substituted with ice cream. When it arrived, it had both cream and ice cream! The strudel was nice, but I’m used to strudel having flaky pastry, and this one had more of a short biscuity pastry. Dinner done, we walked back to the car and drove back to the motel for the night. This entry was posted on Sunday, 30 August, 2015 at 13:18	and is filed under Diary. You can follow any responses to this entry through the RSS 2.0 feed. You can skip to the end and leave a response. Pinging is currently not allowed.